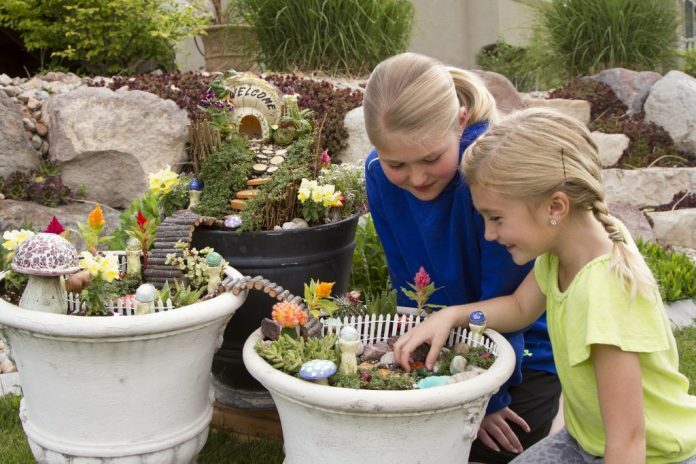 Unleash your imagination by creating a fairy garden. When I was a kid, I loved to take my dolls and stuffed animals outside to play. I constructed outdoor homes with whatever I could find in or sneak out of our garage. A discarded box became a cabin. I made a lake by burying a bucket and filling it with water. As a grownup, I found it hard to keep that connection of creativity through play. However, as an avid gardener, I have delighted in combining two favorite activities: growing flowers and plants with childlike creativity. Tiny houses in a garden make me feel like I’m a kid again playing with my toys. But this time, plants are involved, and I like to get my hands dirty. Fairy gardens are part fantasy, part art, and most definitely part of the world of home horticulture. Creating them is easy to do because many garden centers cater to customers’ cravings for miniature items and plants. Fairy gardens don’t necessarily have fairies in them. Sometimes called miniature gardens, they are “fairy sized” and populating them with actual fairies is entirely a matter of taste. I like to include fairies, gnomes and small statuary animals; sometimes I just make inviting spaces, in case fae folk from out of town need a place to crash or get a bite to eat. The first consideration in designing a fairy garden is its size; the next is its simplicity or complexity. If you live in an apartment or don’t have much yard space, an easy medium is a flower pot – a fairy terrarium. Load up on moss and stones and you can have a green fairy paradise year-round. One of the most stress-free ways to get started outside is to place small furniture, either store-bought or handmade, in hidden places under bushes or into little nooks of your garden. Take a stroll down the dollhouse aisle at a local craft store and gander at the possibilities, or go the DIY route and build little chairs and a table out of sticks or laths. Other considerations include accessories and varieties of plants. Fairies are often attracted to the sounds of bells, so you can place a wind chime in a spot where the breeze catches it or hang tiny bells from tree branches. Sunflowers, tulips and other plants that draw butterflies create (according to lore) an ambience that attracts fairies, too. An old wheelbarrow and a bird bath can keep your fairy garden contained. If your aspirations are bigger, clear an entire spot in the yard and construct a whole fairy town. Over the years, I have loved everything about fairy gardens and I am constantly amazed by the creativity that goes into every decision.